GA tix are showing available for night 2 in Chicago as of 1:33 PM Chicago time today 5/15. I was shut out of the presale on Innocence day and now nothing when they went on sale with the general sale. I tried through the PC and the TM app. I have seen the band every tour since they opened for J. Geils in 1981 touring October. Looks like that streak will end as I will not pay the scalpers on Stub Hub. Maybe a second show where we actually get GA tickets like every tour since they've been doing GA might be nice. Looks like the Verified Fan to stop scalpers was an unmitigated failure. It only succeeded in causing fanclub member to miss out. Real Fans? First tour I will miss since 1981. Doesn't get much more real than that. Don't be so sure. Very few got them today so you will likely get them Monday. 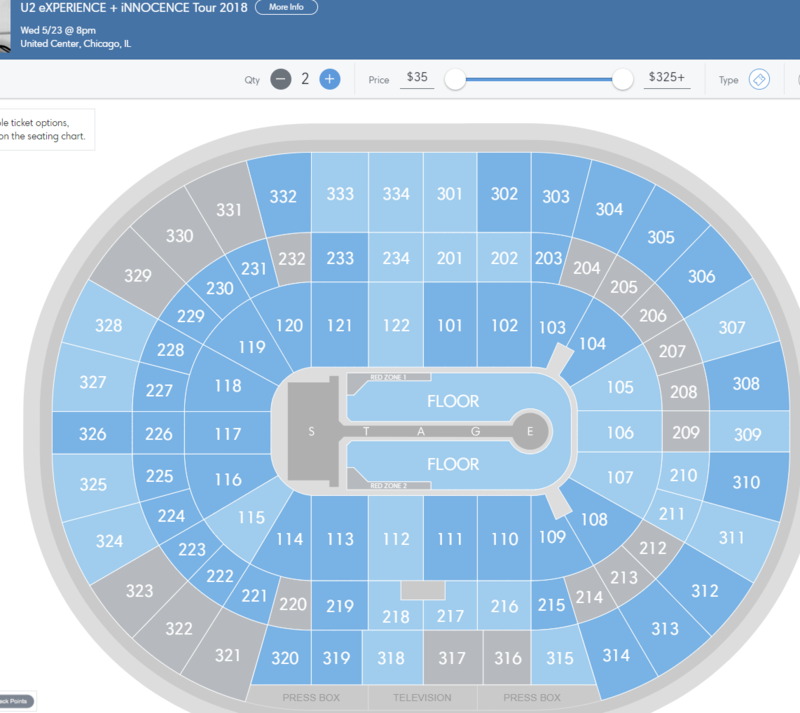 And this who doing verified fan and TM to limit tickets getting to scalpers tripe really rings hallow when the right side of the screen is filled with secondary market re-selling of tickets. That whole idea should be removed from the equation. No GA in Chicago when they went on sale at 12:00. I have been going to U2 shows since 1981. If additional shows aren't added and GAs are as rare as this show for the subscribing fan club member, JT '17 will be the last. Very disappointed in this go round. Right not on those songs but In God's Country, Exit, Mothers of the Disappeared, Running to Stand Still (87) all had him filling out the sound. As for the guitar playing, right, It has to be rough for him. That is how he writes songs, after all. If I recall from 1987, many of the Joshua Tree songs require a second guitar. I have not read anything about Bono's progress from the bike accident since 2015. Is he still unable to play? If not, which I suspect is the case, will we hear the second guitar from under the stage or will it just be Edge? Speculation, yes, but worth pondering. The fuss is WIRE group subscribers were supposed to be able to get tickets at 9am this morning. No one was able to get anything until tickets mysteriously became available at 11:30am. That means many of us spent two and a half hours clicking on Search Again to no avail until the great ticket release. For those of us who did not give up, we were rewarded but it was nerve wracking until then. Just got 4 of them. Had been trying since 9am. Same here. Odd, very odd. Ticketmaster- No GA avaiable as of 9:01am! Just got 4. Highly suspicious but happy to finally get them. Don't be so sure. There was nothing at 9:00.